When the State of Kansas obtained a preliminary injunction to prevent publication of my book — which I hadn’t even written yet — I knew I was on to something. Maybe something big. At least something Kansas didn’t want seeing the light of day. The question was, Why? As a dealer of rare literary manuscripts, a client approached me in early 2012 bearing two handwritten letters from Truman Capote, the bestselling author of In Cold Blood, along with other intriguing documents from a famous murder case: the 1959 slaying of Herbert W. Clutter, his wife, and their two children in the bucolic village of Holcomb, Kansas. As the book tells it, the killers, believing Clutter had $10,000 in an office safe, found no safe at all, yet murdered the family after finding less than $50 in the house. My client, the son of former Kansas Bureau of Investigation (KBI) Director Harold R. Nye — who was also the lead field investigator for the Clutter murder case — was reluctant to part with his father’s papers, but family medical needs eclipsed sentimentality, and he turned to my company to auction what was indisputably compelling memorabilia related to an iconic American crime. We had also discussed a book featuring his father’s central role in a famous case, contrasting investigation techniques then and now. But before the auction gavel could fall, a hammer of a different sort came down on us. The media generated by the sale announcement was more extensive than anticipated, and reached the director of the KBI, who personally contacted us in efforts to seize the Nye archives away from us before they were auctioned off. When we politely but firmly declined their request — these were, after all, private papers and personal memorabilia — the Kansas attorney general issued a cease and desist suspending the auction, which soon morphed into an intimidating and surprisingly aggressive lawsuit. The State claimed that everything in the Nye archives were “highly confidential criminal investigation files” that Harold Nye had “misappropriated,” and that my client and I were engaged in a “conspiracy” involving his father’s personal records. All this for a long-solved 50-year-old crime. So there we were, two guys going up against a whole state with comparatively unlimited resources, each battling for possession of a cache of closed-case documents that appeared to pose little threat to anyone: mug shots and fingerprint cards of Richard Hickock and Perry Smith, the Clutter family killers; copies of original investigation reports Agent Nye had filed in performance of his duties; a couple of personal notebooks; and the various ephemera that finds its way into the chronicle of a lawman’s life. Separately, in an act of remarkable synchronicity, I had also come into possession of the Death Row letters and journals of both Hickock and Smith, each bringing extraordinary insights into what was assumed to have been a closed investigation for which the guilty had been executed. In the face of litigation my curiosity had spiked, and I wondered what was in these documents that Kansas wanted so badly, or at least did not want made public. Not particularly a true crime devotee, I had only given the investigation reports cursory attention at first. But now I was intrigued: what was in here that could warrant a long and costly lawsuit? Like an eager historian I began digging into the materials that lay before me. As I paged through Agent Nye’s investigative notebooks and copies of actual case reports he had written, I was reminded of key passages in Capote’s masterwork, but they were hazy, since my first and last reading of it was decades earlier. So, I reread the book with new vigor. This time, every word seemed to have fresh perspective, since I had access to actual handwritten notes describing Nye’s interviews, his discovery of clues and gathering of evidence, his random thoughts, and a hastily penned transcript gleaned while extracting a confession from one of the killers — all of which made the experience as visceral as being on the scene in 1959. In a matter of days I went from merely curious to deeply absorbed, poring over a riveting firsthand account of a murder investigation that had piqued the interest of two generations of readers worldwide. And what I found wasn’t just eye-opening, it revealed a tellingly different story than the one laid out in the pages of In Cold Blood. The reasons for Kansas wanting this material so badly became clearer. The KBI had long hung its hat on the Clutter murders as its landmark case. What I found would surely dim the shine on the heroic legend they had cultivated for decades. As our lawyers mounted a vigorous defense in court, I continued work on the book, researching page after dramatic page of revelations which the public had never seen, including one disclosure that, were it pursued more vigorously leading up to the 1960 trial, could have given way to a much different outcome. Peeling back the layers, each scenario laid out in the documents made little sense on its own. But, as with many mysteries having too many threads, when woven together properly a different tapestry began to emerge. 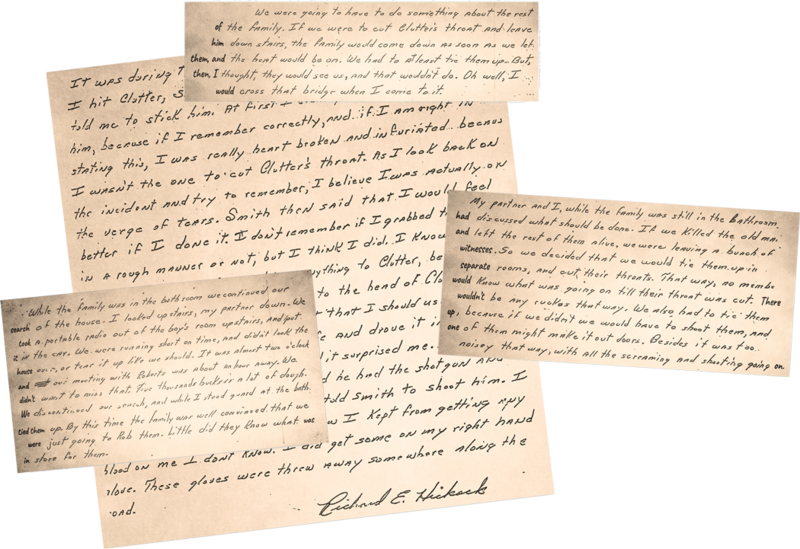 Richard Hickock’s unpublished handwritten letters, some 200 pages of them, disclosed a number of startling accounts, including a meeting with a mysterious man at a nearby café just one hour after the murders — a key fact corroborated in part by Harold Nye’s official reports, but one that was never introduced at trial or investigated more fully… a meeting purportedly to collect a bounty for the murder of Herbert Clutter. If that was the case, then motive would shift from mere robbery to murder for hire, making for an extraordinary variation in a well-told story. This newly discovered evidence, especially the introduction of an unknown third party, seems to have been ignored if not concealed by the coordinating investigator, KBI Agent Alvin Dewey, whose friendship with both the Clutters and Truman Capote may have clouded official protocols in the investigation. Moreover, despite new information becoming known to authorities years after the murders, but before the killers had been executed, the Kansas attorney general at the time appears to have held back from further investigation. Could this be why Kansas came after us so hard a half-century later? As is often the case with powerful institutions, could a keen drive for self-preservation have overshadowed a full accountability of justice? After four grueling years, the Kansas District Court hearing our case affirmed the primacy of our First Amendment rights and ruled in our favor, declaring the State’s basis for the injunction was misleading. In a very public David versus Goliath battle, we had prevailed. From day one, Capote claimed that his book was “immaculately factual,” but the unveiling of minor distortions, along with numerous errors and omissions discovered in primary source material, form the hallmarks of my own book, And Every Word Is True. I never imagined our work would take on such an American classic, but facts are facts, and as the author of a now somewhat revisionist work my job was simply to convey the evidence as discovered, while presenting cogent theories as to what these disclosures might mean and why were they suppressed. If I’ve learned anything in my many years of seeking out and acquiring rare and valuable manuscripts from around the world, eventually anything once tucked away in the pages of history can surface at the most unexpected times. Harold Nye’s long-hidden cache of case files comes to mind, and look what has come of that discovery. Which makes one wonder: what else is there we don’t know about, perhaps hidden in the dark recesses of some long-forgotten archive, like that final scene in Raiders of the Lost Ark, where just one more artifact is stowed away in some cavernous, nondescript warehouse containing thousands more, secreted away from public view. Putting things in ironic perspective, the State could have just as easily purchased the entire lot for $20,000 at auction and been done with it.